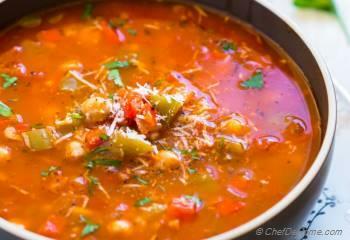 Vegetarian and healthy stuffed pepper soup with chickpeas. Filling and comforting just like stuffed pepper casserole. Can't beat comfort of stuffed pepper casserole for winter dinner! 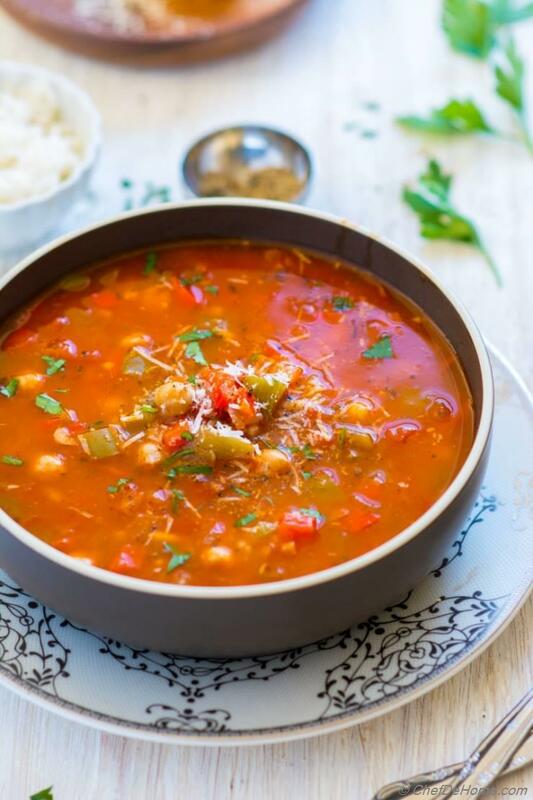 This vegetarian stuffed peppers soup is hearty yet lean with healthy chickpea protein, filling with a serving of rice, and loaded with flavors stuffed peppers. Just one soup and dinner is served! You can call it stuffed pepper soup or deconstrued stuffed pepper's soup. All ingredients used to make comforting stuffed pepper winter casserole are here, but in form of a soup. A warm cup soup on cold winter night is all I need for dinner. So, when I'm making a weeknight dinner soup.. I like to make it hearty and filling so that just soup is all I need to prepare. One pot, one recipe, few ingredients and dinner is ready. Rest of the time enjoy catching-up day with the family. Sounds fun! Isn't it? Stuffed Peppers are perfect for a family-style weeknight dinner. Traditionally, green bell peppers or rainbow peppers such as green, red and yellow are stuffed with protein sauted with aromatics, herbs and spices, and little bit of starch to make it filling such as rice, quinoa or barley. There are infinite possibilities what can be stuffed in peppers. Only thing is, bell peppers can be expensive sometime to make family-size meal. 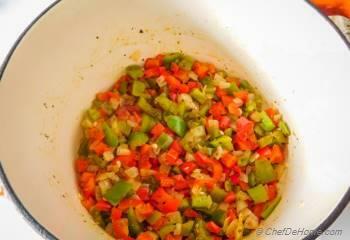 With stuffed pepper soup, however, you don't need a lot of bell peppers. Like this 4 servings of soup need only two bell peppers. Green peppers are less expensive than red or yellow ones. So you can also use 2 green peppers for this soup. Today, I used one green pepper and one red to give this soup a delicious orange-red color. Don't get me wrong. I'm not allergic to sun and love California weather. But sometimes winter does not even feel like winter here. Like today, it is almost end of Autumn and temperature scale still indicates 90 degrees outside. 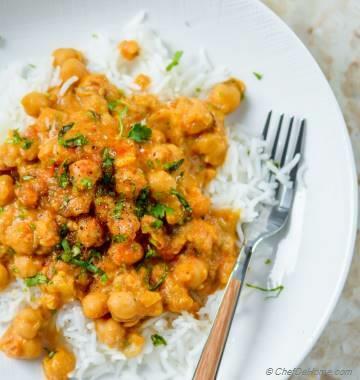 However, this year, I decided to open up my recipe-to-try list and cook everything I want to eat in cold weather such as soups, casseroles, spiced curries and a lot more! Seriously, a good homemade soup can keep you warm without artificial heat or jackets. Healing from with-in. Plus homemade soups are clean and easy to digest which is why I make a lot of them every season. In fact we have stews or curries on our weeknight dinner menu whole year. 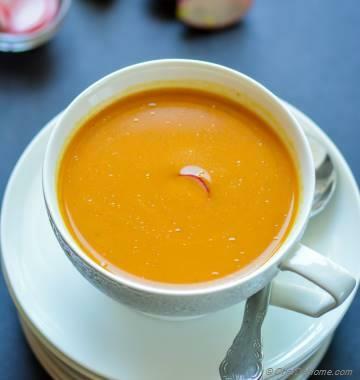 Yet, on a cold winter night, the charm of holding a warm cup of soup is beyond comfort… is actually healing. Stuffed pepper soup recipe was in my to-do list since long. I decided to add vegetarian spin to it inspired from chickpea stuffing in my Chipolte Chicken Chickpea Stuffed Pepper recipe. You are most welcome to add ground chicken or turkey if prefer but I wanted a lean veggie soup for dinner that day. If planning to add chicken or turkey, just saute it with spices until it is no longer pink. Then follow rest of recipe directions as-is. The addition of rice makes stuffed pepper soup filling. 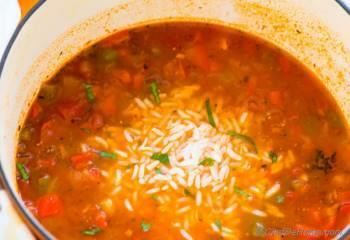 Rice absorbs a lot of liquid as they sit in soup. So, I like to boil rice separately and add them just before serving. When I want a thicker, full-body soup and have plans to serve it immediately.. Then I boil the rice with soup and add 1 cup more liquid. 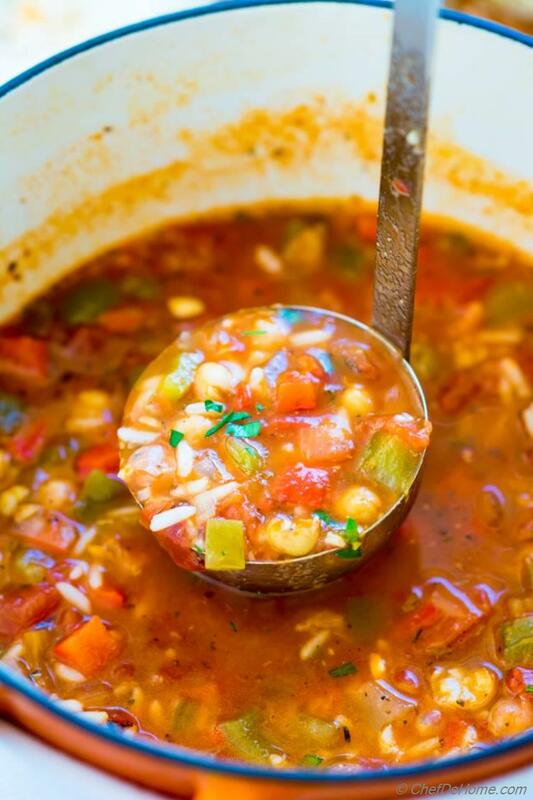 Starch from rice gives very nice thickness to soup and makes it even more comforting. Only recommendation is to serve that soup immediately otherwise rice absorb lot more liquid than I would like and soup becomes stew like. Some days I even replace rice with quinoa. Both rice or quinoa are gluten free. 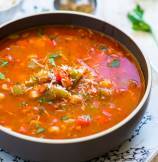 This stuffed pepper soup is gluten free as long as broth used is gluten free. If you skip cheese and use vegan broth, soup is also vegan. 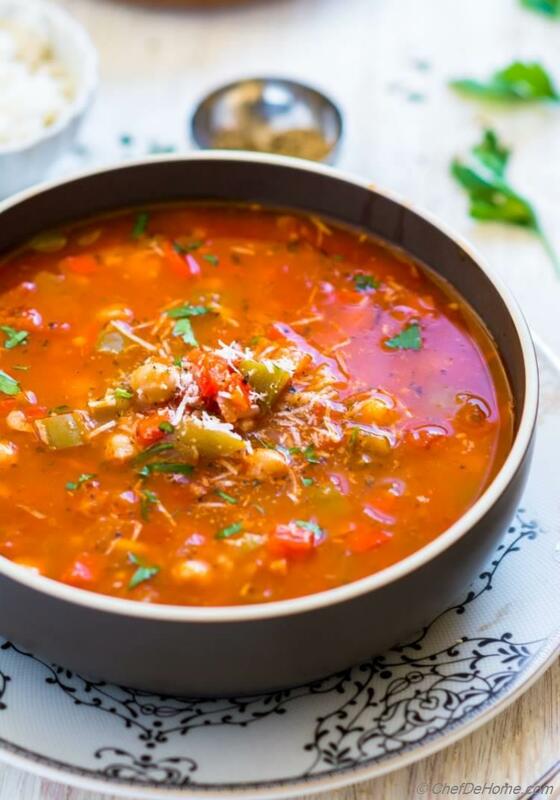 With comfort of rice, protein and texture of chickpeas, flavor of peppers, herbs and tomatoes… all come together to make hearty stuffed pepper soup. That much and it is still vegetarian. Friends, season has just started. I hoping to share all of my favorite soup with you. 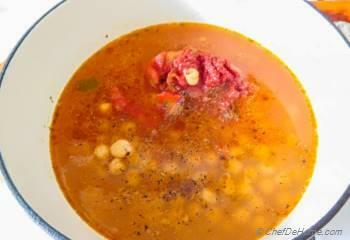 You can check complete collection of soups I shared on blog here. Few more flavors to enjoy Soup Season! Total Time 35 minutes Prep Time 5 minutes Cook Time 30 minutes Difficulty Easy Yields 4 Servings Serves 4 Notes No. of servings depends on serving size. Smart Swap Skip cheese and this bowl of soup is also vegan!! 1. Heat oil in a deep heavy bottom pan. Add diced onion and garlic and saute until onions are soft. 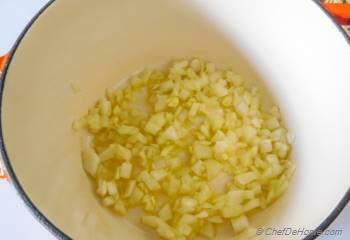 Keep heat medium low so that garlic does not burn. 3. 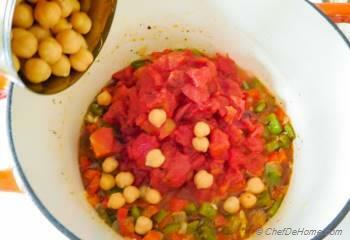 Add crushed tomatoes, tomato paste, and rinsed chickpeas. 4. Add vegetable stock. Mix well. Bring to boil, lower heat to medium-low and simmer for 20 minutes. 5. While soup is cooking, cook rice as per package directions. Drain water upon cooking, and set aside. 6. Once soup is ready, mix in cooked rice. Cook for 2 more minutes to bring all flavors together. Taste and adjust salt. Add black pepper per taste. if serving later, store rice in a separate container. Follow the above step just before serving. 7. Add fresh chopped parsley and sprinkle some parmesan chese. Serve immediately. 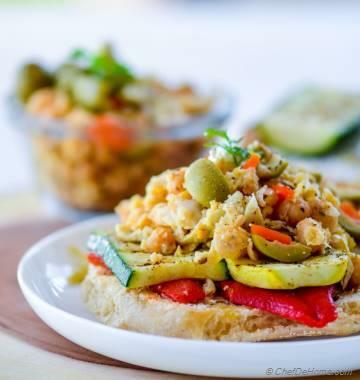 Yummy - made this with quinoa, also used hot and green peppers. Thanks for letting me know. I'm glad you enjoyed this soup. Hello, I would like to make this however I want to use quinoa instead of rice. When should I mix in the quinoa? Hi Mary, If you notice, I added cooked rice at Step 6. You can replace it with cooked quinoa. If you intend to cook quinoa in the soup, then I would increase the amount of liquid as quinoa absorbs water almost like rice. I hope it helps. Hello this recipe sounds delicious and I'm going to make it tonight! Do you happen to know the nutritional information per serving? This looks phenomenal! I love stuffed peppers. thanks, Megan! Our love for stuffed peppers is indeed mutual!